The Des Moines Area Regional Transit Authority (DART) operates a family of transportation services that connects thousands of people every day to jobs, school, medical appointments, entertainment and more. DART is the largest public transit agency in Iowa, serving Alleman, Altoona, Ankeny, Bondurant, Clive, Des Moines, Granger, Grimes, Johnston, Pleasant Hill, Polk County, Urbandale, West Des Moines and Windsor Heights. Enriching Lives, Connecting Communities, Expanding Opportunities. DART’s Transit Impact Report is an overview of its services and statistics. The document was compiled and completed in FY2018. To view report flip book full screen, select the right-most icon below. To download a PDF copy of the Transit Impact Report, click here. DART is operated with the support of local property taxes and fare revenue. The Fiscal Year 2020 (July 1, 2019, through June 30, 2020) budget reflects the transformations that will take place in the transit system and agency. To download the complete FY2020 DART Budget Book, click here. To download the complete FY2019 DART Budget Book, click here. 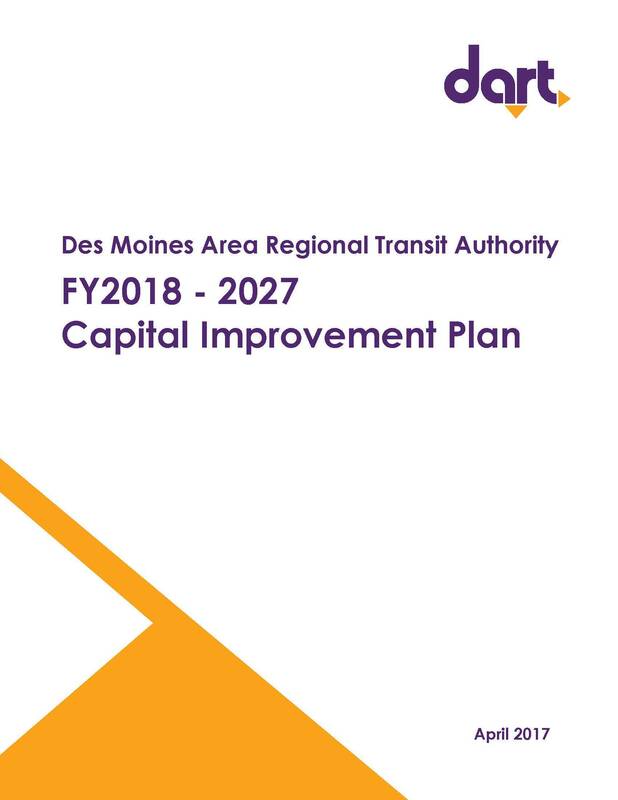 To download the complete FY2018 DART Capital Improvement Plan, click here. DART received $7.88 million in federal stimulus money as part of the American Recovery and Reinvestment Act. Such money is typically reserved for capital purchases, such as buses or buildings, in keeping with federal law. Operating expenses are usually covered by local revenues such as property taxes and bus fares. However, Congress allowed for 10 percent of the ARRA money – nearly $800,000, in DART’s case – to be used for operations. That substantially softened this recession’s blow to DART’s operating budget, which has suffered from flat tax revenues and declining fare collections. DART spent more than a third of its ARRA money on seven new Orion buses, which rolled onto DART’s property in March 2010 and hit the roads quickly thereafter. The buses, along with 13 additional buses purchased with separate federal funding, went a long way toward updating DART’s fleet, replacing 16-year-old buses that break down more frequently and were more than twice as expensive to maintain. The stimulus money also helped DART equip its fleet with GPS technology, such that staff and riders will have access to real-time information about the buses’ locations. This will help DART planners make the routes more efficient, and riders will need look no further than their smartphones to see when the next bus will be by their stop. Stimulus funding also helped with the construction of a bus storage facility, the replacement of concrete at DART's operations headquarters, and the purchase of bike racks, bus maintenance hoists, bus signage and bus shelters.